Griffin’s Vacuum-Assisted Wellpoint Pumps are available in 4″, 6″, 8″ and 10″ models. These pumps are designed for handling high volumes of water and air. The pump automatically primes and reprimes at suction lifts of 25 ft. or greater. These pumps are capable of handling flow up to 3500 gpm, head conditions up to 150 ft and over 200 cfm of air. The pumps are available with the Wind Tunnel® high volume air handling system. Griffin Wellpoint Pumps are particularly suited for wellpoint dewatering systems in pervious soil formation. Combined with Griffin’s line of wellpoint accessories it is easy to install and operate an efficient and complete wellpoint system. 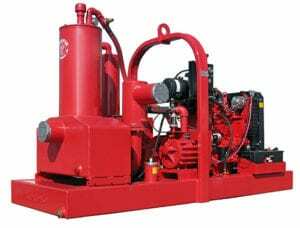 These pumps are available in diesel and electric options, with an integral fuel tank or trailer mounted. Other options are available with these units including hydraulic drives. Contact Griffin for more information and options available. Other sizes and models may be available.